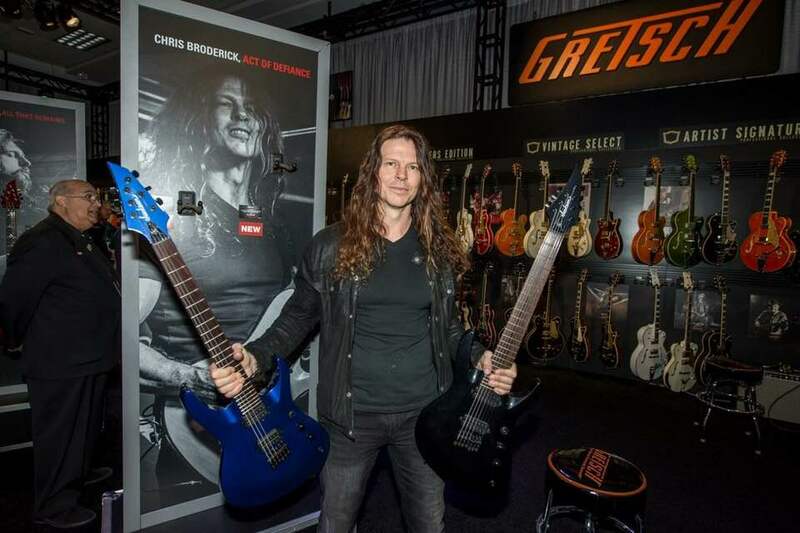 With his dazzling thrash fretwork, Act of Defiance guitarist and All That Shreds 2017 Guitarist of the Year Chris Broderick is heralded as an exacting and modern metal master. The results of the collaboration are sophisticated riffing machines loaded with the premium features needed to keep up with the most demanding music produced today. The Pro Series Signature Chris Broderick Soloist HT6 is a 25.5” scale guitar featuring a resonant mahogany body and one-piece through-body maple neck with scarf joint and graphite reinforcement for rock-solid sustain and stability. Its 12”-radius rosewood fingerboard with 24 jumbo frets is ideal for all playing styles, comfortable for both low riffing and soaring leads. Contemporary guitarists require tonal versatility and punchy clarity to keep pace with the rapid twists and turns of today’s metal. A pair of Broderick-designed custom DiMarzio® direct-mounted humbucking neck and bridge pickups punch well above their weight, cranking out a monstrous tone that will pin your ears back. The volume control conceals a push/pull switch for coil-splitting, unlocking even more tonal options while the tone control’s push/pull switch enables the tone circuit. A mini-toggle killswitch allows for the stuttering effects that have become integral in modern metal. The Jackson Single-String hardtail bridge creates perfect intonation along the entire length of the neck to ensure complex chords ring true, working in harmony with the Jackson-branded sealed die-cast locking machines for tuning stability that can withstand an excellent pick-hand thrashing without shifting. Hey you! Make sure you read All That Shreds Magazine! A brutal beast, the Pro Series Chris Broderick Soloist HT6 is available in Metallic Blue or Metallic Black with a matching reverse 3×3 AT-1 headstock, single-ply black neck and headstock binding and black hardware. Dunlop® strap locks also ensure your axe won’t go flying during onstage acrobatics. This unique design features separate and individually direct mounted string saddles. Each string is isolated, allowing for individual resonance per string and a more focused sound.